Tumbleweed - This is a photo taken of her at about 15 years. 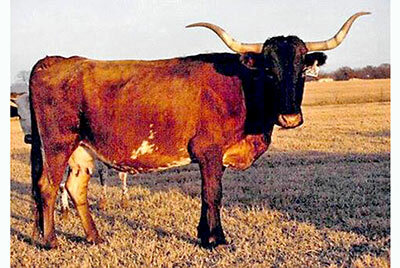 She was used by McGill Ranch and produced one of the better Classic sons, Tin Horn. Robert Harrell bought her and used her extensively in embryo, mostly to Butler bulls. She lived to be 22 years old and died at Tim and Mary Sue Cline's in Aspers, PA. She was well appreciated. The Clines erected a 15' tall memorial to this faithful old Yates cow. She was promoted more than any all Yates cow I can recall and did a good job for McGills and each one who owned her.